I began detailed drawings of people and landscapes at six years of age, and moved to painting oil on canvas by age 10, which I continued through the late 1980s. In 1990 I became captivated by ancient art history, studying hundreds of illustrations and accompanying text from archeological books at the library. I began to experiment with painting on plaster in hopes of capturing a wall mural effect similar to those in my studies, and proceeded to create my first fresco secco-style piece with much exhilaration. Because I was educating myself in a new medium, it moved me to think beyond any previous formal training, which proved quite invaluable. My passion for creating fresco-inspired paintings grew and flourished for the next 10 years. In February 2002 I opened Bogdanoff Gallery, a working studio, on Royal Street in New Orleans’ historic French Quarter. 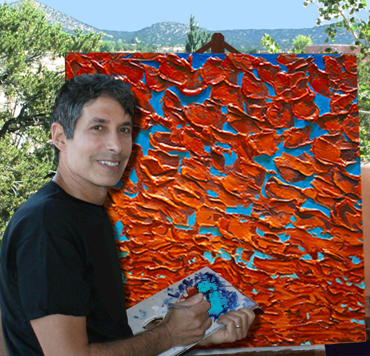 In 2006 I relocated the gallery to Santa Fe, NM, home to America’s second largest art market. Now, 28 years after creating my first fresco piece, I am recognized internationally for my interpretive fresco secco plaster paintings. My work is displayed in residences and businesses worldwide, and have been featured in numerous national publications. I am influenced by historic art from the Greek Bronze Age through the end of the Renaissance: scenes depicted in wall murals, friezes, reliefs, vase paintings, and sculptures. I strive to capture the essence of not only a time in civilizations lost but also of past cultures which continue to fascinate archaeologists and art enthusiasts alike. I envision what perceptual properties and styles would be best adapted for a displayed wall painting of a specific subject at that time in history and assimilate my interpretation onto the plaster canvas. I also incorporate my neo-expressionist and realist works with the fresco secco technique, to convey passion and mystery to the viewer through a marriage of classic and modern styles. My intent is to achieve the creation and reinvention of images which have the powerful ability to evoke myriad emotions through the awe-inspiring richness and variety of select subject matter and the technique of paint application to plaster. In the past few years I’ve introduced works featuring heavily textured surfaces. In order to achieve this, I spread plaster onto either cradled panel board or canvas using knives and fingers. While applying the plaster I consider the subject matter that I want to project. This process gives a three-dimensional effect which I enhance through painted shadows and highlights. My initial introduction to fresco art came during my studies of the Greek Minoan civilization, circa 1500BC. The artists from the settlement of Akrotiri on the island of Thera (now known as Santorini) were innovators in utilizing color from the earth, and their free style of drawing and interpretation of subject matter was extraordinary. I believe that art as we know it today was borne from these ancient artists, and I honor them through my work. All artwork copyrights are held and retained by the artist Steve Bogdanoff. Images are not to be printed, copied, appropriated or distributed without prior permission of the artist. Purchase of artwork does not convey copyrights.